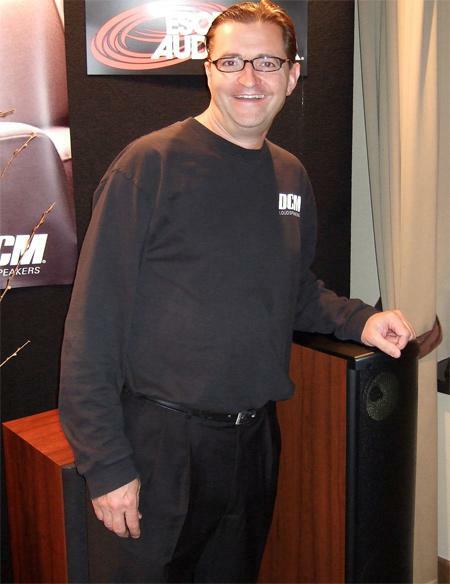 "We had more traffic on Friday than we had all of HE2006," said Dynaudio's Mike Manoussellis. At CES, the Vandersteen/Audio Research room always strikes me as being like an oasis—and not just because of the potted plants they have in the room. And so it was in the room sponsored by New Jersey dealer Audio Connection at HE 2007: music presented without hype or bombast, and simply relaxing to listen to. 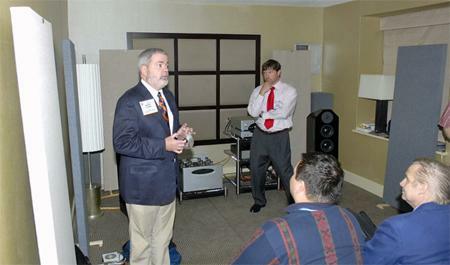 The speakers were the Vandersteen 5As ($16,900/pair +$5000 for carbon fiber cabinets), with Audio Research PH7 phono stage ($5995), CD7 CD player ($8995), Reference 3 line-stage preamp ($9995), and Reference 110 amplifier ($9995). 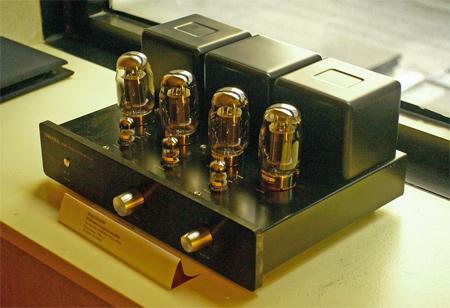 The analog front end was the Clearaudio Anniversary TT and Stradivari cartridge, with a Graham Phantom tonearm. Cables were Audioquest William E. Low Signature interconnect and Everest speaker cable. Other Stereophile writers, like Wes Phillips and Stephen Mejias, had mentioned how impressed they had been with the sound in the Sjöfn room, but what I had not appreciated until I visited the Swedish manufacturer's room towards the end of the Show was: a) how small these speakers were; b) how good the stereo imaging was despite the speakers being right up against the wall behind them; and c) how much thunderous bass was being produced by just two reflex-loaded 4" woofers! Of course, the Guru speaker ($1800/pair), photographed here by Larry Greenhill, is designed to take advantage of the low-frequency boundary reinforcement afforded by the close-to-the-corner positioning, but even so, I was surprised by the result. The speakers also sung on soprano vocals; Sjöfn is a company to watch out for, especially as the fact that the speakers must not be used out in the room makes them very spouse-friendly. Stereophile columnist John Marks brought an encyclopedic knowledge of music and musicians to the magazine when he started his "Fifth Element" column in March 2001. At HE2007, he played some of his favorite recordings in as many rooms as he could, including his own recording of the Herbert Howells organ piece Larry Greenhill mentioned in another posting (Master Tallis's Lament, a personal favorite of mine) and an extraordinary choral recording, When David Heard, from the young composer Eric Whitacre. As you can see from this photo taken in the Egglestonworks, Rogue, and Echobusters room, Showgoers very much appreciated John's efforts. 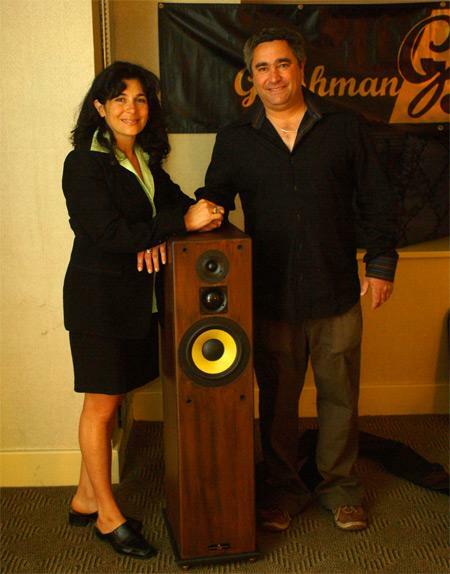 As Robert Deutsch mentioned in his report from the 2007 Montreal Show, Ofra (left) and Eli (right) Gershman of Gershman Acoustics have been exhibitors at just about every audio/home theater show the past few years. 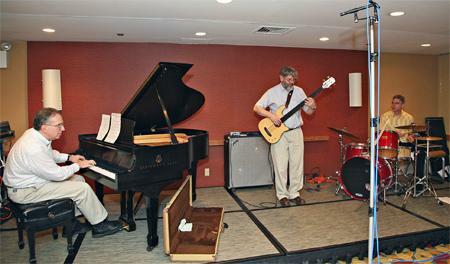 As in Montreal, the Gershmans were demming their new Sonogram speaker at HE2007. More conventional in appearance than their flagship Black Swan, the Sonogram, photographed here by Larry Greenhill, is priced at a very competitive $2500/pair. 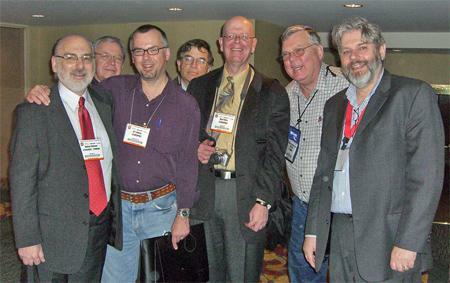 An enduring aspect of Audio Shows is the meeting up of old friends, colleagues, and acquaintances, who all share a sense of belonging to a single community. 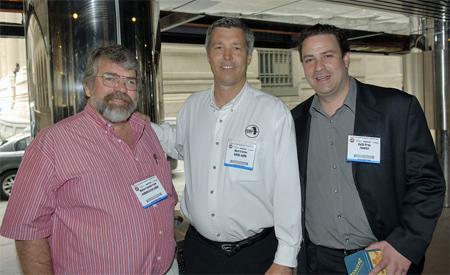 Shown here in a chance meeting at the Grand Hyatt's entrance are (l–r): veteran speaker designer Richard Vandersteen, tube amp manufacturer Mark O'Brien of Rogue Audio, and Stereophile's associate publisher Keith Pray. 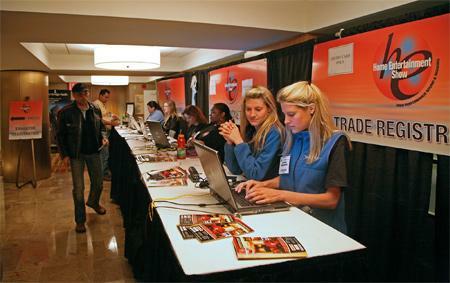 The official closing time of HE 2007 was 5pm on Sunday. I was surprised to see, then, that there were some people registering even as late as three o'clock Sunday afternoon. Now, that's real devotion to the hobby! ...and 3.6kW into 2 ohms! All in a day's work for Krell's $40,000/pair, Krell Evolution 900 monoblock amplifier. On passive display with its top off, you can see that the amplifier has three output modules, each containing a pair of driver stages, 28 bipolar output devices, and a massive heatsink that vents heat in chimney fashion through vents in the top and bottom of the chassis. 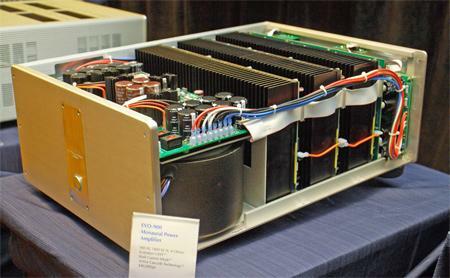 The power supply features two 3kVA toroidal transformers, 52 electrolytic capacitors, each rated at 1800µF, 900watt, and 105°F. Weight? Again I didn't want to know, but was told it was a mere 175 lbs! Patrick Chu, creator and designer of the $80,000/pair, two-way, Mandarin Supreme loudspeaker, explained that the products’ name is a synthesis of two words: Loimin means "delightful understanding" and Chay means "ateliar or studio." The frequencies from 750Hz upwards are handled by a 1" tweeter loaded with a 19" horn comprised of alternating layers of cherry and oak wood. The bass, which is rated down to 22Hz, is handled by 10" and 12" woofers. This composite was by far the least active speaker material I've come across. Rapping it with my knuckles was like tapping on granite. The woofer enclosure was made of concrete with a cloth covering. I didn't ask about the loudspeaker's weight because I didn't want to know. The nominal impedance is 8 ohms, and the voltage sensitive a very high 92dB. Although I didn't audition any familiar reference recordings, the speaker had a dynamic sonic texture with a midrange emphasis. 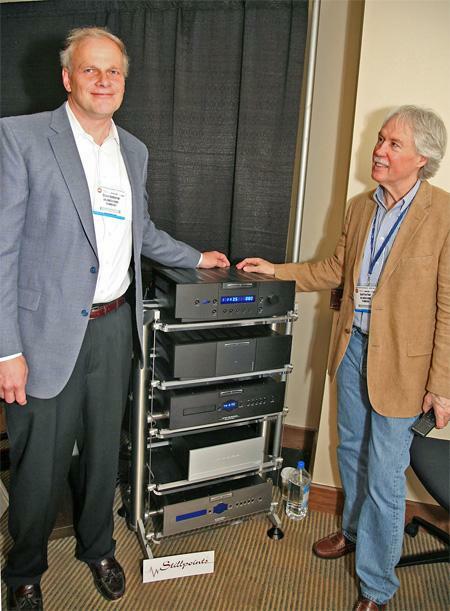 Balanced Audio Technology's Steve Bednarski is a big guy, but he's not a giant, and BAT's Geoff Poor is not nearly as diminutive as he looks in this picture. It's just a matter of perspective with a wide-angle lens. The rack between Steve and Geoff houses the new top-of-the-line Rex preamp, described by Wes Phillips in another posting. 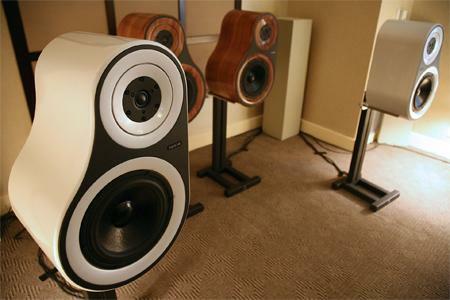 HE 2007 had, as expected, some very expensive equipment being demonstrated, but there were also some modest-priced and still very–good-sounding systems. 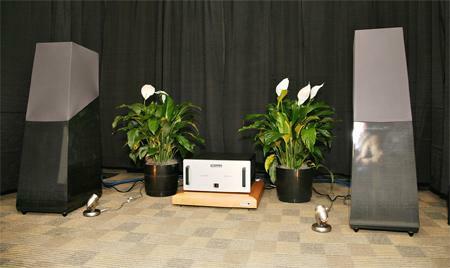 One of these was the system in the DCM room, based on the DCM TFE 200, a substantial floor-standing speaker priced at just $1000/pair. With a Jolida CD player and integrated amp, the total price for the system was under $3000—and that was including $200's worth of cables from Esoteric Audio. The Man in Black is Al Congdon of DCM. As far as I can tell, Omaha Audio has no connection with the city in Nebraska: its headquarters are in California, and the products are made in China—but "created, designed and checked in the USA." The system they were playing used their own speaker (named, fittingly enough, the Omaha Speaker), a fairly large two-way with some resemblance to Sonus Faber products ($2000/pair), the Omaha Tube CD player ($1600), and the OD-300B single-ended-triode integrated amplifier ($1400, photographed here by Larry Greenhill). 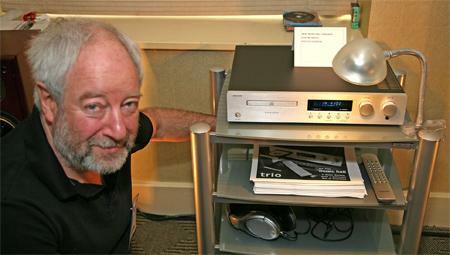 At the Stereophile Ask the Editors session, Sam Tellig was raving about this amplifier and the value it represented. Based on the sound of the system (smooth, highly musical) I have to agree with him. Remember the name: Salagar Sonics. 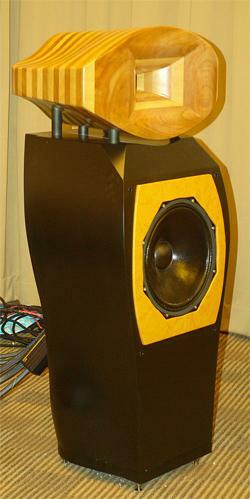 It's the name of a new American speaker company, whose first product, the Salagar S210 ($7500/pair), still in prototype form, made a strong impression at HE 2007. It's an active two-way—digital crossover; the amp uses the latest B&O ICE module—with a Scanspeak AirCirc tweeter and a 10" Peerless VIFA mid-bass driver, in an unusually-shaped (and highly inert) enclosure. 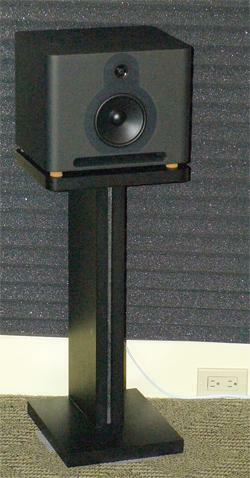 I thought these speakers sounded terrific: lively, low in coloration, and with excellent imaging.